Very nice saddle, very traditional English looking and rides very similar to a treed saddle, lots of twist so great for people with bad hips. The pommel chambers can be replaced with different widths to suit individual horses. It gives plenty of wither clearance so perfect for high withered horses, the Velcro panels underneath allow for a tailored fit to suit individual horses. This saddle is better for the slightly narrower horses as the pommel chambers do not come out as wide as the Western models. The newer version of this saddle has flocked panels and not the Velcro panels, which gives it a more traditional appearance. Used on a 16.3hh TB ex racer, a 16hh ID x TB and a 12hh Welsh Mountain pony. Very well made saddle with nice German leather, wears very well, scratches quite easily on pommel and fenders and takes a long time to break in, but buttery soft when it has broken in. Pommel chamber can be replaced with different widths to suit individual horses, the pommel chambers are quite flexible on fit between sizes (I.e. size 2 will fit a wide range of different horses, size 3 if quite a lot wider). Velcro panels under the saddle allow the saddle to be tailored to suit the individual. Stirrup rings mounted on leather under the seat of the saddle with a choice of 2 stirrup settings. Used at all paces including short endurance rides (10-12 miles). Size 2 pommel chamber used on 16.3hh TB ex racer, 14.3hh Welsh x Arab and 15.1hh HW Cob, Size 3 pommel chamber used on 14hh Welsh Cob. Personal account of researching for a treeless. Part one and two if you follow their links. i do not have a big budget for a saddle. actually i don’t have a saddle budget at all, so when i went out shopping i knew i was going to have to pinch my pennies. luckily my mom gave me her old saddle to sell and that started my saddle fund! the first saddle i purchased, back when billy was just a two year old, was a Wintec Wide Dressage Saddle. i thought it would be the perfect fit because it has the adjustable gullets, allowing you to change out the gullet as your horse grows and changes. the problem? when billy was two the widest gullet was the one that fit. also, because billy started out with such a dip in his back, the saddle bridged terribly. 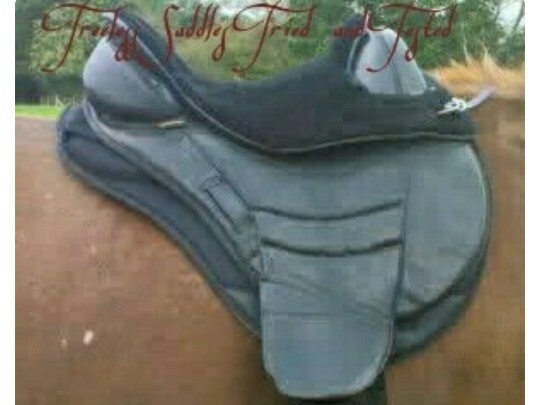 the more i padded to help with the bridging the taller and more unstable the saddle became!